Both blankets are made from recycled cashmere sweaters. Both were Christmas gifts – the green/brown for my husband, the blue/grey for my son. They are the size of a twin mattress. Each one needed about 12 sweaters, but it all depends on their size. Naturally, men’s large will yield more fabric to work with than an woman’s small. With the green/brown blanket the random composition of squares is all I could do with the cashmere I had. I tried for more uniform design, but did not have enough of one color. All I could achieve was that not too many of the same color touched sides. For the blue/grey I started with cutting not squares, but rectangles that were the multiplications of the previous squares. 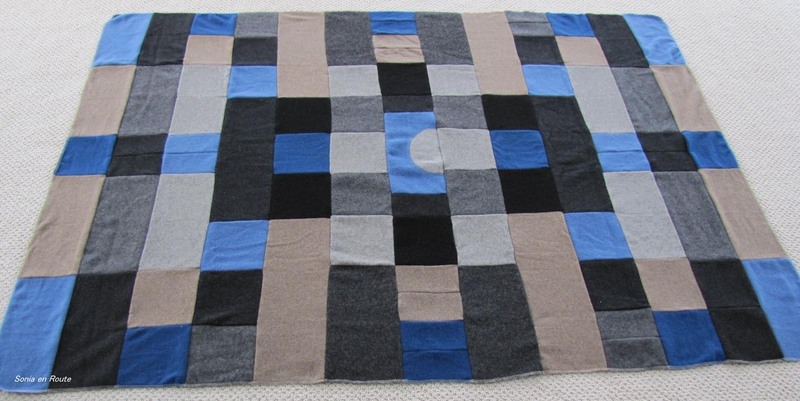 That gave me more freedom in designing a pattern that would be uniform throughout the whole blanket. My contribution to One Word Photo Challenge – Blanket. Tak, ta potrzeba porządku i regularności w naszym życiu. Obie to mamy. Czasami nam to pomaga, a czasami trochę wadzi. Ja wolę zielony – jest jakiś weselszy.